You just found the perfect home for your family. 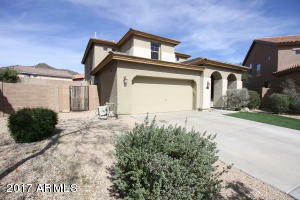 Spacious 2437 sq ft, 4 br,3 bath 2 story with tile throughout. Located on a quiet cul-de-sac. The loft was converted into a 5th room/office. Master br with it's own master bath. Large eat in kitchen w/walk in pantry overlooking the family room with a fireplace. Stainless steel appliances included. Large living room and dining room. New carpets with upgraded padding. Walkout to your spacious backyard and enjoy your heated jacuzzi then take a dip in your built in swimming pool. This home boasts an on q system. The seller is including a 1 year home warranty for added protection. The exterior is freshly painted. Hurry!!! This home won't last! Call today for your private showing. Directions: Start From n. sonoran mountain pkwy & pyramid peak. From there, go North on 67th avenue. Continue north past jomax. Turn left on n. Sonoran mountain pkwy. Left on w. Desert mirage drive. Turn right on 73rd lane.